Premier of Nevis Hon. Joseph Parry, sealed his commitment to Brown Hill Communications on Monday, when he received an update on the Call Centre’s operations and its plans to provide greater employment opportunities to the residents of Nevis. 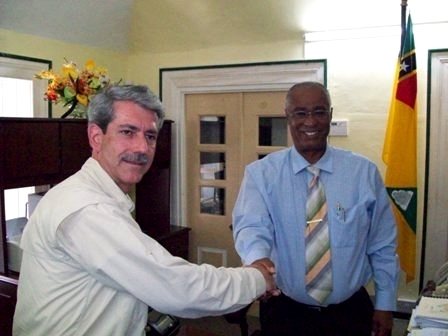 At a briefing at his Bath Hotel office on July 29, 2008, with Managing Director, Mr. Sheik-Nur Hagi and Bell Canada representative, Mr. Dan Chapman, the Premier stated his government’s obligation to lend support to the Nevis Call Centre. Mr. Chapman, a 19-year veteran with Bell Canada, will be on island for five months to train and coach Brown Hill Communications staff. The first group of trained 25 persons is presently taking calls at the Centre and a second group would be ready for August 6th. A staff of 50 are expected to be trained and working by the second week of September. coming to see me and updating me on the productivity of Brown Hill Communications. I am also pleased to say that by the end of the year the Call Centre would have a staff of roughly 100 persons,” Premier Parry said. Entry-level workers will earn a salary of EC$2300.00 per month, while Supervisors and Managers will realise a more attractive monthly income. Premier Parry stated that this was the first time a call centre on the island offered services that provided employment for such a wide cross-section of persons. So far, they have employed a number of school leavers, as well as persons with A-levels, CAPE and University degrees. Brown Hill Communications Ltd. provides customer services for the small to medium businesses of their sole client, Bell Canada. Persons with skills in Management and Leadership are being encouraged to contact the Call Centre for employment opportunities. The children in the St. John’s community already began to reap benefits from Brown Hill Communications through several donations to the schools in the area. According to Mr. Hagi, the centre is now fully operational. He went on to thank persons who had answered their call and who had gone through the interview process. He also expressed gratitude to the entire community of Nevis, in particular the people of Brown Hill for their support.